Six children: Brian, born 1970; Jeffery, born 1972; Bradley, born 1975; David, born 1978; Melissa, More…born 1985; Layne, born 1985. After high school graduation, I attended and graduated from Ricks College. I went immediately to BYU summer school and worked at Bullock and Losee Jewelry Store in Provo. 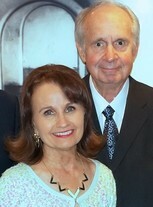 Larry Boyle and I met and dated and became engaged shortly before Larry graduated from BYU in the summer of 1968. He was headed to the Army for basic training in Ft. Ord in California, then off to Officer School in Georgia. As luck would have it, Larry blew his knee out in basic training, was given a medical discharge and returned home to me. We were married two months later and have enjoyed these many years together. I worked at two different law offices and finished my Bachelor's Degree at University of Idaho, after attending Ricks College, BYU, Idaho State and then University of Idaho. We lived in Idaho Falls where my husband practiced law and served on the District Court Bench. Because we had so many kids, I became active in community programs in Ammon, Idaho, where we lived for twenty-five years. Kind of a fun thing happened right when we decided to move to Boise. Since so many of our boys' friends needed Eagle Scout projects, I directed them to helping with baseball diamonds we were trying to finish. The end result was two beautiful new diamonds with bleachers, fences and etc. The best part about the new fields was that the Ammon City Council named one field after me for organizing the league of Knothole and Little Leaguers for almost fifteen years. This was pretty exciting to me since even my kids laugh at how I throw a baseball. We then moved to Boise when Larry was appointed to serve on the Idaho Supreme Court. Our two oldest were gone to college and on a mission when we arrived in Boise, so I worked at clerical jobs and as a travel agent with Murdock Travel to help pay for college educations, missions, etc. When I youngest son began first grade, I again went back to work during the winter months to serve in the Senate Majority Office in the Idaho Senate. Larry left the Supreme Court when he was appointed to the Federal Bench as a United States Magistrate Judge where he still serves today. I left the State Senate the year five of our six children had new babies requiring lots of help from me at that particular time. I have pretty much remained retired because we were hoping to serve a mission after Larry was released as the Young Single Adult Bishop for three years. Unfortunately, Larry was diagnosed with Parkinson's so life has taken a bit of a forced different direction. I suppose we do feel like we were somewhat serving a mission because of the request of the United States Department of Justice to travel to teach law and courses of jurisprudence to foreign government prosecuting attorneys and foreign judges in countries such as Pakistan, Azerbaijan and Bangladesh. He also taught Rule of Law in Ukraine and Crimeria and held court proceedings for American citizens imprisoned in Thailand. It was immensely rewarding for me to be with him on some of his assignments. At present, we are enjoying traveling to see our kids and the grandkids at their significant events like receiving Eagle Scout awards, dance recitals, school events, baptisms or birthdays. Beverly Rigby Boyle has a birthday today. Beverly Rigby Boyle added a comment on Profile. Beverly Rigby Boyle has left an In Memory comment for Profile. Words can not express adequately my saddness in hearing the news of Reva's passing. I was so sad I did not get to talk with you both at the reunion. May you know that she was an angel to many and a friend to all. She exemplified joy and happiness always. I will always consider her to have been a dear friend. Beverly Rigby Boyle posted a message. I appreciated your note on the Message Forum page. So glad you enjoyed the class photo. You were such a cute guy, always had a cheerful smile and fun personality. Thank you for your hard work on the reunion and yes, I also consider you a good friend. My school years in Burton kept that group of kids, in my estimation, as pretty important people in my life. Beverly Rigby Boyle added a comment on Kristine Smith Hosac's Profile. Beverly Rigby Boyle updated profile. View. Beverly Rigby Boyle changed profile picture. It is hard to think of Von without thinking of Carla as well. They were always together and truly meant for each other. I was saddened when Clyde Ricks called to tell me of Von's passing. How it touched me to know and hear of his good life and of the many numerous caring family and friends he left behind. Carla, may you be strengthened by our Father in Heaven and always remember how very much you are admired and loved. Beverly Rigby Boyle added a comment on Profile. New comment added. Beverly Rigby Boyle has a birthday today. New comment added.